Twenty-four hour library access for law students is coming soon! This week, the construction team is working on a new doorway to the California room downstairs. 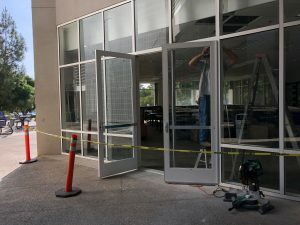 When the law library is closed, law students will be able to use a key card to open the doors downstairs and get into the California room for late-night study. The main entry to the Law Library will remain upstairs, and we’ll continue to use the existing lobby for check outs. This way, we’re doing a cost-effective building update that provides expanded access for law students who prefer to study late at night or early in the morning. We’re also preserving the quiet space downstairs when the library is open, to support our students who work best without distractions. We are very excited about showing off these improvements next month when our students are back on campus. Look out for further updates!